Embedding the infographic on your blog or website is very easy and you'll find instructions how to do it here. This infographic is licensed through the Creative Commons Attribution-No Derivatives License which allows redistribution both commercial and noncommercial as long as it is unchanged and credited to CanadaFAQ.ca. Most Expensive ZIP Codes in Canada by http://www.canadafaq.ca/. 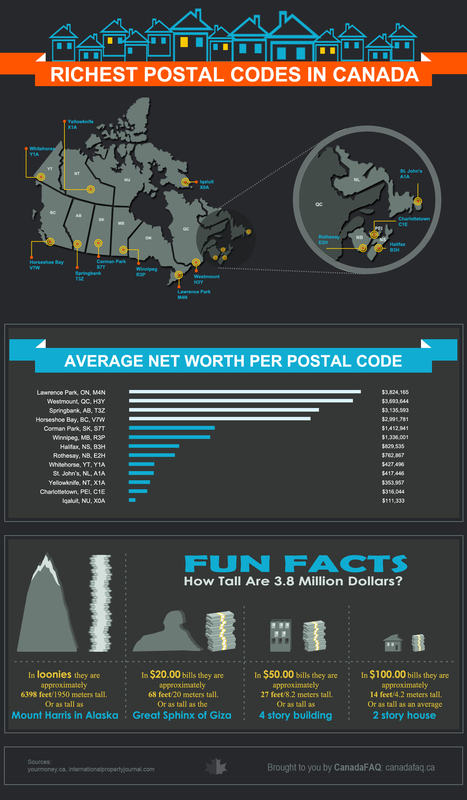 Lawrence Park, Ontario, Westmount, Quebec, and Springbank, Alberta are among the richest postal codes in Canada. Lawrence Park is a wealthy neighborhood and a planned garden area in North Toronto. The neighborhood features a mixture of architectural styles such as Colonial, Georgian, and Tudor Revival. Lawrence Park boasts winding roads, magnificent houses, and plenty of park space. Westmount in Montreal is also a beautiful neighborhood with historic houses and private schools. Young families came to Montreal in search of cheap land and modern houses about a century ago. Today, houses cost between $1,000,000 and $4,500,000, and many wealthy people live here. The neighborhood offers beautiful views of the St. Lawrence River and Montreal. Notable residents of Westmount are the Desmarais family and Brian Mulroney. The area borders with Grot Roads, Stony Plain, and other arteries with heavy traffic. Westmount boasts cozy restaurants, specialty shops, and boutiques. Other highly priced residential areas and wealthy postal codes include Winnipeg, Manitoba, Corman Park, Saskatoon, and Springbank, Alberta. Springbank is situated in the foothills of the Rocky Mountains and features old and new houses and rural estates. This rural suburb features many golf courses, among which the Elbow Springs Golf Course, Springbank Links Golf Course Club, and Pinebrook Golf Club. Home prices here range between $1,000,000 and $6,000,000. Vancouver is also notorious for pricy estate listings and expensive luxury mansions. A $38-million mansion is one of the most expensive real estate properties ever listed in Canada. Horseshoe Bay is a wealthy suburb that is situated in West Vancouver. A house in this neighborhood costs over $1 million. The BC Ferries terminal links the area with Bowen Island, Sunshine Coast, and Vancouver Island. Corman Park is a wealthy residential area close to the city of Saskatoon. The main landmarks in the area are the Bone Trail and the Wanuskewin Heritage Park, which is an archeological site. Winnipeg is another of the richest postal codes, with an average property price of about $1.33 million. Winnipeg features diverse architectural styles and elements, from century-old buildings to aluminum balconies, which were designed by architects such as Johanna Hurme and Sasa Radulovic. The housing prices in Halifax, Nova Scotia are in the range of $750,000 and $800,000. Tuxedo is one of the wealthy suburbs here, with plenty of attractions to visit. There are sculpture gardens, a theatre, museum, and zoo. Rothesay is found in New Brunswick and is one of the wealthiest areas in the country. Established as a shipbuilding centre, today the town boosts high incomes and standard of living, modern amenities, and natural and historical landmarks. Whitehorse, which is known as the driest city in Canada, is found in Yukon. The average property price is around $427,000, and there are many historical sites such as the Yukon Transportation Museum and the Miles Canyon. You can buy an affordable house in places such as Iqaluit, Charlottetown, and Yellowknife, where housing costs between $111,333 and $353,957 on average. Iqaluit is one of the largest communities in Nunavut, and its cityscape features a mixture of distinct and functional buildings. The capital of the Northern Territories Yellowknife is the home to residential areas such as Range Lake, Niven Lake, and Frame Lake. Many buildings in Yellowknife are clad in metal siding, and the average price of properties is around $354,000. Charlottetown, the capital of Prince Edward Island, is a city of historical lots and architectural sights such as the St Dunstan�s Basilica and the Victorian mansion Beaconsfield House. Located on the Avalon Peninsula, St John�s has a distinct architecture, with elements of the British colonial style. Landmarks include St Patrick�s Church and the Confederation Building. The infographic also shows how tall dollars are. In loonies, for example, 3.8 million dollars are 1,950 meters tall. This is the height of Mount Harris in Alaska. You will reach the height of the Sphinx in Giza if $20 bills are used instead.